With colourful and frequently changing exhibitions Bath Postal Museum has something to offer for everyone. Explore 'The History of Writing' with famous actor Richard Briers. Learn why postal services worldwide owe so much to Bath and its illustrious residents Ralph Allen and John Palmer. Listen in on the lives and experiences of postmen and postwomen past and present. Find out how the mail has been delivered through history, and some of the hazards encountered on the way. Discover what life was like on board a Victorian Mail Coach and why knowing the calls of the post horn could literally be a matter of life or death. At Bath Postal Museum there is something for everyone. We provide colourful, frequently changing exhibitions, interactive games and quizzes, models and collectables and feature historic 'talking heads' video characters. There is also plenty to do for young visitors, who can try on costumes and play our stunning 'Potholes and Pitfalls' board game. 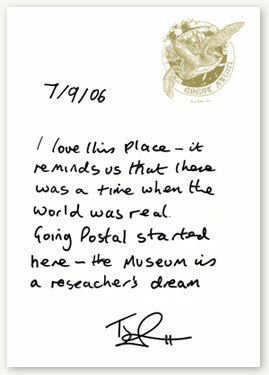 The museum shop offers a large range of postcards and gifts. We also stock items for the serious philatelist and would-be collectors. Groups and schools can be catered for. Please ask for details of our special facilities and rates. History of the Museum Bath Postal Museum was founded in 1979 by Audrey and Harold Swindells and was originally situated in the basement of their house at 51 Great Pulteney Street. The museum was a success from the word go and got a favourable mention in the Sunday Times Good Museum Guide in its first year. However, by 1984 the original premises had become rather overcrowded when a wonderful opportunity arose – the entire building at 8 Broad Street became vacant. This was the site of Bath's main Post Office from 1822 to 1854: the very place where the first recorded posting of a Penny Black took place on 2 May 1840 – four days ahead of the official date! The building belonged to Bath City Council who kindly granted a subsidised lease to the museum. After much fundraising, the ground floor display was opened at the end of 1985 by celebrity Friends Richard Briers and Leslie Crowther; the Queen Mother sent a greeting by pigeon! In 2003, due to the "Best Value" Directive, Bath & North East Somerset Council informed the Trustees that the subsidised rent could no longer be justified. seum's rescue by offering a 15 year lease in the new Post Office redevelopment in Green Street at an affordable rent. The Council was delighted that a solution had been found and very generously allowed the museum to stay put until the new premises were ready. The Post Office is also excited that the museum will be sharing the same entrance and have given a handsome donation towards matched funding. The museum hopes that the move to the site in Green Street will take place in late summer. Imagemakers, who will be designing the new museum, have exciting plans to retell the story of People and the Post in a thoroughly modern manner, which will continue to entertain and educate visitors.